We book air ticketing for all those region but special domestic air ticketing serve for our clients. We are proud to be part of a country, nestled in the laps of the beautiful Himalayas. For many years, people have been drawn by the mystery and beauty that has surrounded them. Now with our Everest Experience flight we make your visit to the highest peak just as easy. We have several airlines companies (Guna airline, Yeti airline, bhuddha airline and Agni air) operate daily Mount Everest flight (Mountain flight) from Kathmandu airport if weather permitted. 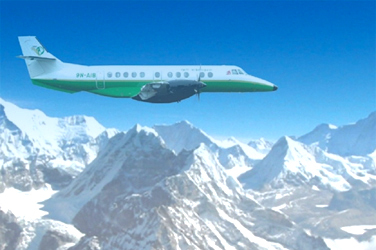 Yeti Airlines's moun tain flights are spectacular than any other operation in Nepal because Yeti Airlines's SAAB-340 flies at an optimum altitude of between 20,000 to 25,000 ft. and shows you the Himalayan Range like never before. The mountains are at eye level for your maximum viewing pleasure. The Dornier-228 shows you Mt. Everest by virtually flying into the lap of Everest (Khumbu Valley). Unless you decide to take up mountaineering, this is the closest view of Mt. Everest that you'll ever see. Regular flights are conducted daily from Kathmandu towards the Himalayan Range in the North and East of Kathmandu. The flight generally takes off in the morning and lasts for one full hour. This is the quickest way to get a close look at Mt. Everest, the highest mountains in the world (pictured above). Other mountains that can be viewed at close range are Nuptse (7879 M), Lhotse (8501 M), Cho Oyu (8000M), Makalu (8475 M) and Kanchenjunga (8584 M). 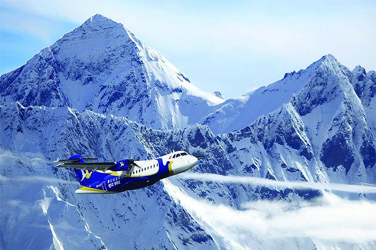 Buddha Air operates SAAB-340 and Dornier-228 aircraft for Mountain Flights. Both aircraft have large and clear windows and provide superlative sights of the Great Himalayan Range. Buddha Air's mountain flights are spectacular than any other operation in Nepal because Buddha Air's SAAB-340 flies at an optimum altitude of between 20,000 to 25,000 ft. and shows you the Himalayan Range like never before. The mountains are at eye level for your maximum viewing pleasure. The Dornier-228 shows you Mt. Everest by virtually flying into the lap of Everest Unless you decide to take up mountaineering, this is the closest view of Mt. Everest that you'll ever see. Unlike in other aircraft, the non-tinted windows of both SAAB and Dornier provides you with excellent opportunity to photograph the mountain and keep your memories fresh forever. Sharper and clearer vision of the Himalayan Range is where your money is best spent. The ideal wing position of both aircraft means that you have an unobstructed view of the mountain ranges. Buddha Air operates one full hour of mountain flight.